NBA Playgrounds Update 1.1 for PS4 is now available for download. The new update brings new features like the Challenge Mode, 15 new players that can be unlocked through player packs, five new versions of Shaq, a shot-meter, a penalty for those who quit matches, and more. With Challenge Mode, you’re able to directly challenge another player online. You do this by agreeing on a code, opening the online mode, switching to Challenges, and entering the code to face each other. A shot-meter was added to help finding the perfect timing for shots, dunks etc. The shot-meter can be disabled in the options and it takes the distant to the hoop and the player’s statistics into consideration. To challenge another player, you must switch to the challenge mode in the online menu and define a challenge code. By default, your challenge code is your nickname, but you can change it to your own, personal code. The person you are challenging must enter your code. If you have been challenged, please enter your challenger’s code and press “Accept”. All challenges are unranked and your ranking/ELO will be unaffected by the results of the challenge. Rebounding accuracy improved in NBA Playgrounds Update 1.1 for PS4. The duration of the Stars Lottery Pick was reduced NBA Playgrounds Update 1.1. NBA Playgrounds Update 1.1 fixed a problem that prevented the ball from stop spinning after scoring. Issues related to the strength of the force feedback effects were addressed. 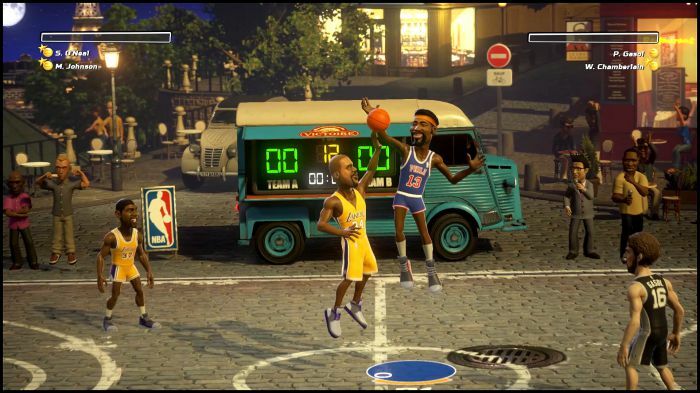 check you game update and download NBA Playgrounds update 1.1 is for PlayStation 4.